Hittite invasion and sack of city of Babylon about 1535 BC was taken advantage by the Kassites, people from the Iranian plateau who invaded and conquered Babylon about 1532 BC. They founded principalities of which is little known. It seems that the Kassites who ruled Babylon until about 1170 BC mostly adopted the Old Babylonian culture which continued to flourish although Babylon lost its former political and military influence in the region. 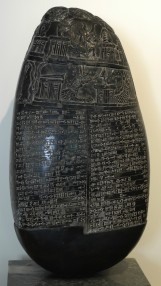 King of Elam, Shutruk-Nahhunte conquered Babylon about 1170 BC and carried to his capital Susa trophies including the stele of Hammurabi’s code of laws and statue of the god Marduk. Elamites destroyed the Kassite dynasty by capturing the last Kassite king who died in Elamite captivity. Shortly after Elamite conquest of Babylon the city of Isin emerged as the center of resistance against the Elamite overrule. The 2nd Dynasty of Isin under Nebuchadnezzar I (c. 1125 BC) drive out the Elamites and led a campaign deep into Elam, conquering Susa and returning the stolen statue of the god Marduk to Babylon. Weakened from the struggles with Assyria the Middle Babylonian Kingdom under his successors became an easy target for Aramaeans and other Semitic peoples. The 2nd Dynasty of Isin was overthrown about 1020 BC and the throne was assumed by the 2nd Sealand Dynasty which ruled Babylon until about 1000 BC.